Operation Meal Time | Go Figure Girl! On a Sunday evening when you might be reading the paper, cooking dinner or petting the dog, I am hard at work in the kitchen building my body. It’s not a lie that almost 80% of your physique is made in the kitchen. Changing your eating habits gets you almost all the way there. Last week I started eating more to propel my muscle growth and I’m already surprised at the changes I’m seeing. Yet after tracking my diet and looking at my macronutrient composition (percentage of carbs, protein and fat), I realized that I’m still consuming way too much protein. I was eating about .8g of carbs for every 1g of protein. My trainer told me that I absolutely had to increase this ratio to at least 1.5:1 to see results. So last week I welcomed Mr. Sweet Potato and his friend, Brown Rice, into my weekly meal plan. I need to be precise about eating because there’s a lot of margin for error, so on Saturday morning I sat down with my coffee and an Excel spreadsheet and took inventory of all the foods that I eat on a regular basis from boiled chicken to cottage cheese. I noted how many calories, grams of protein, carbs and fat were in each each serving by weight and created a food library. Then for the next hour I put together a diet that would get me to my target needs for each day. Believe it or not, this was a tricky task, but I did it! I created a meal plan for days that I workout in the morning and one for days that I workout in the evening and then I set to work to make it happen. After all, you can dream about making changes all you want, but at some point, you need to make the moves. Below is a quick rundown of my food prep for the week that happens every Sunday starting at about 4PM. In our apartment, we like to call it “Chicken Time” because for the next 3 hours, that’s exactly what it is. STEP 1: Buy the chicken and the fish! 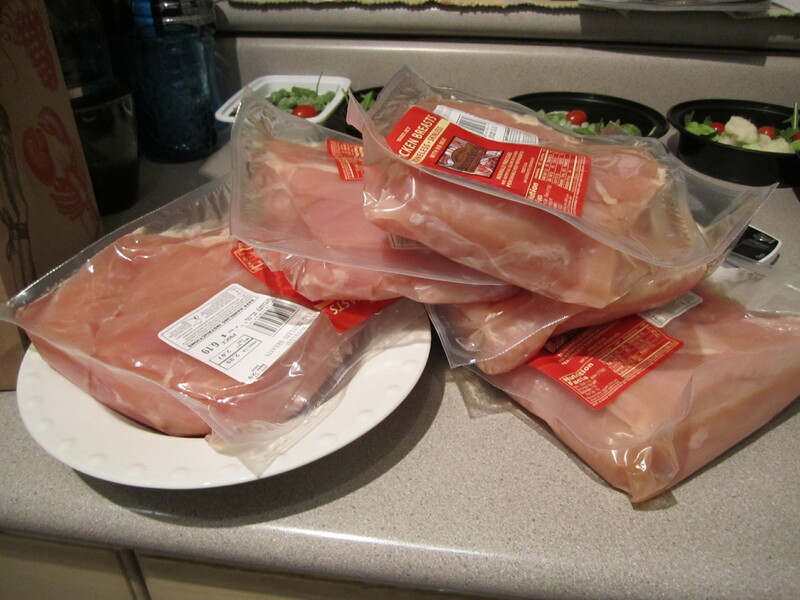 – I start with about 14 pounds of chicken and 1-2 bags of frozen tilapia. – Fish is a nice add-in for variety and it’s an easier protein to digest, so my body is happier when it’s in the mix. – I clean all my proteins and pop the chicken in a pot of water on the stove and throw the tilapia in the oven with my sweet potatoes. – While the chicken boils and the tilapia and sweet potatoes bake, I prep my portable meals and snacks for the next 2 days. 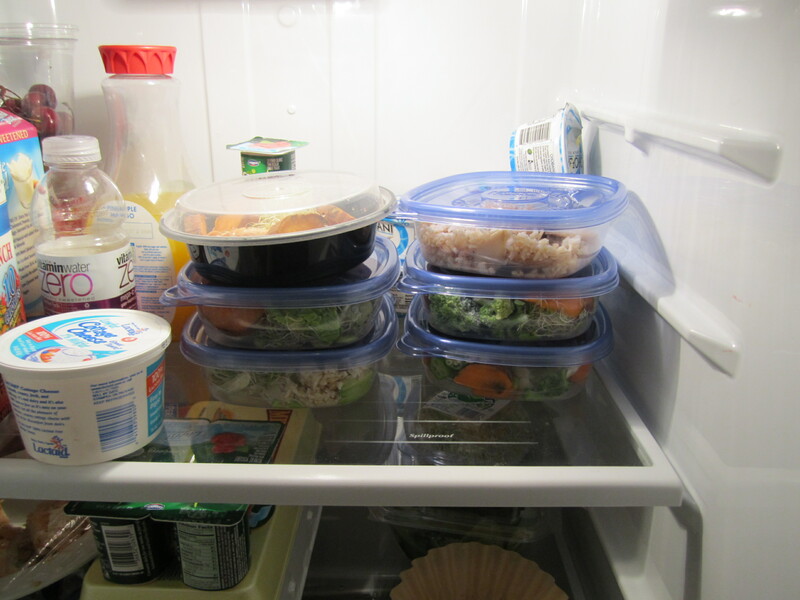 – Since I eat breakfast and my last meal of the day at home, I take 3 mid-day containers to work each day. – I use my digital food scale and divvy out the proper measurements of frozen and fresh veggies and my fat (nuts or avocado). 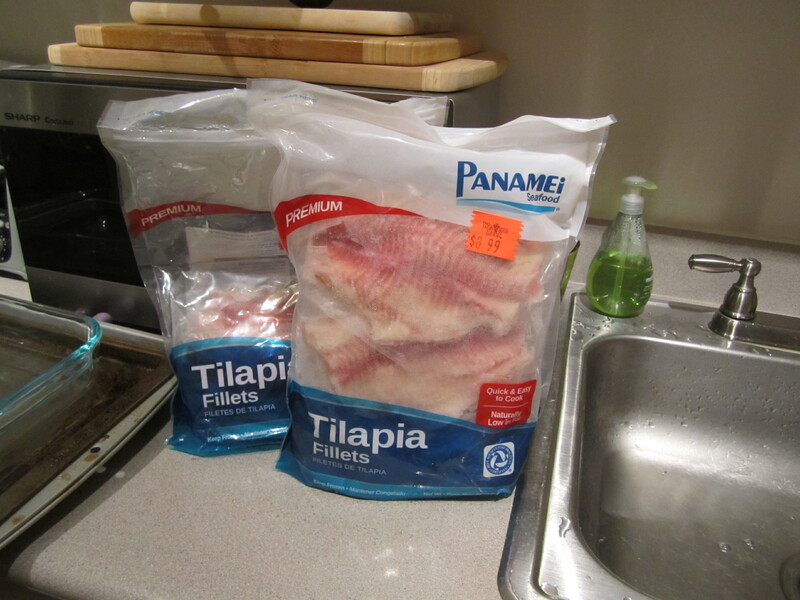 – Once the tilapia and chicken are done I start to dish out my protein for the week into each of the containers. 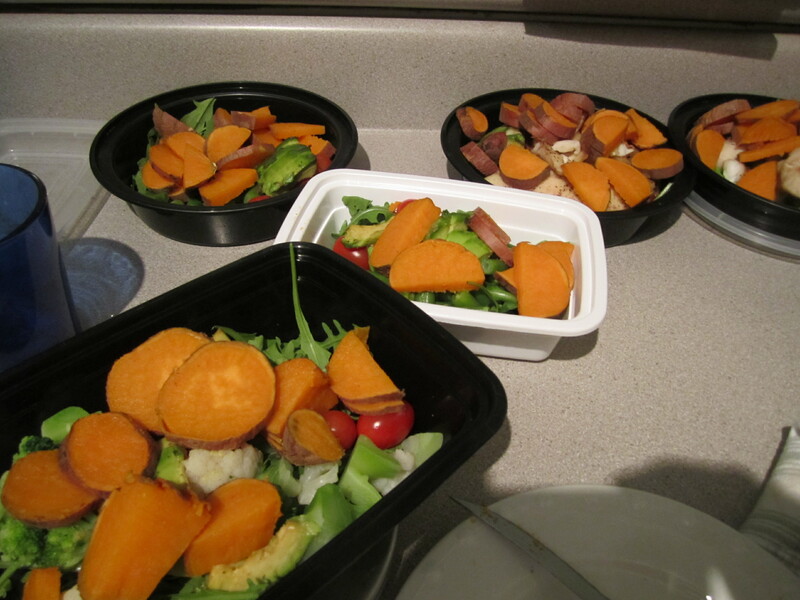 – When the entire meal prep is complete, I will also have about 4oz sweet potato and 4 – 4.5oz protein in each dish along with about 100g of veggies. 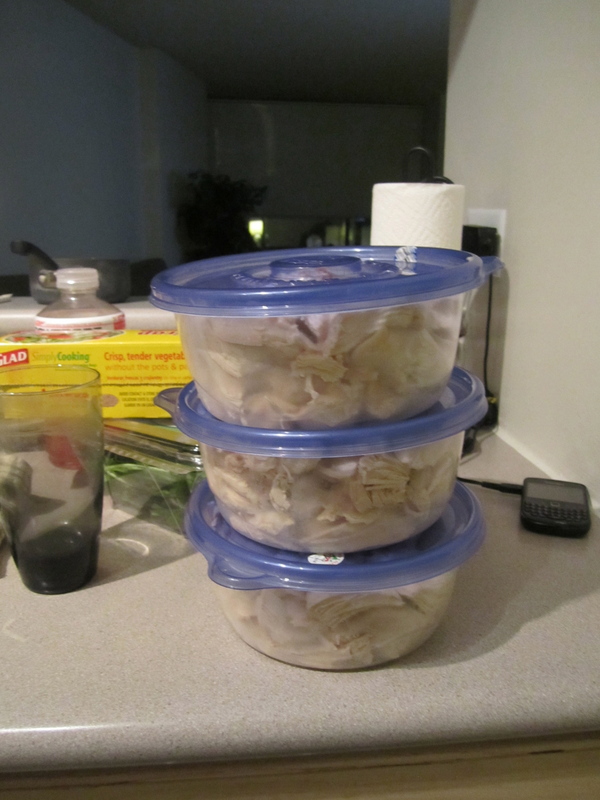 – I typically have plenty of protein left over, so I store two of the three containers shown below in the freezer and keep 1 in the fridge. This way I’ve always got something clean to eat on hand. So that’s it! You cook, you pack, you go live your life – and you eat! How do you get ready for your week ahead? This entry was posted on February 7, 2012 by belcbody. It was filed under Uncategorized and was tagged with calories, carbs, chicken, chicken time, fish, macro, meal plan, meals, sweet potato, tilapia. I’ve been meaning to set aside a day to cook a majority of my meals, but when I do I feel like the chicken is too dry by mid-week. Do you have any tips on how to prepare protein? 1. Place cleaned chicken breasts in a pot with lightly salted water. Water should cover the top of the chicken. 2. Set the pot on the stove and bring to a rolling boil. 3. Once the water has reached a rolling boil, turn down the heat to a low boil (more than a simmer) and let cook for 40 minutes. 4. 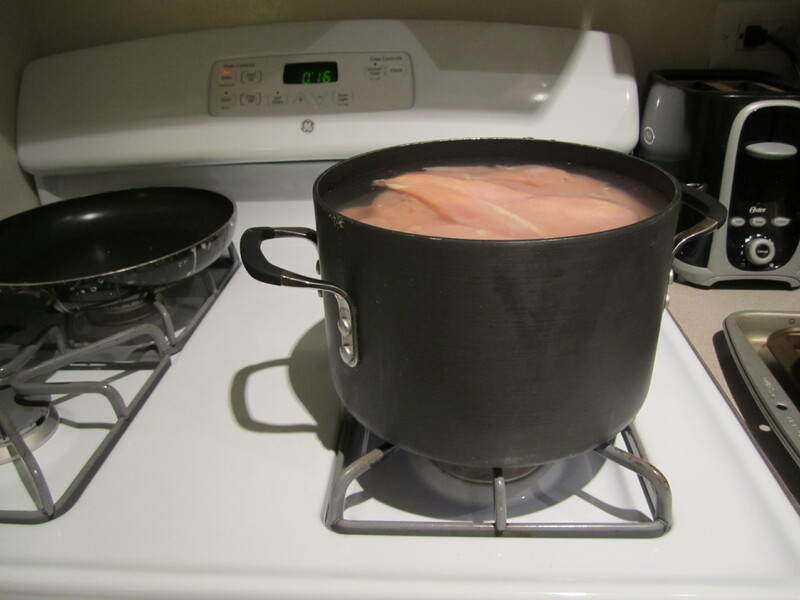 Once the timer goes off, turn off the burner and let the chicken sit in the water for 20 minutes. 5. Rinse the chicken, break apart into small pieces (chicken should be very tender) and store in an airtight container in the fridge. This is how I cook all my chicken and have never had a problem with dryness. Let me know if you get a chance to try this and don’t give up: a little time and effort can make a huge change in your life.